This is a beginner's guide to using a dress form. Why use one, and how? I've found that those new to sewing often view dress forms as something that only professional seamstresses use, however using one is quite easy and intuitive. While mastery of pattern making is an art that comes with years of practice and mistakes, a dress form is still a huge help to beginners for many types of projects. Read on for a quick and dirty guide on how to drape patterns on a form! Step 1: What Is Draping? Before we get started with how to make a pattern from a form, let's first ask the question, why? There are two main ways to make a pattern - flat pattern making, and draping. Flat pattern making involves taking a basic flat pattern (sloper), and altering it to the desired style in flat paper form through cutting, measuring, and taping. An easy example to visualize is if you had a straight skirt, and wanted it to be A-Line. You would slash the skirt at regular intervals, and pivot the pieces apart from the waist until the desired level of flare is achieved. Then you would copy that over to a new paper pattern, and voila, new pattern. Draping is patternmaking done on the form. Draping is useful for all kinds of patternmaking, but particularly for anything with draped elements (hence the name), like the two examples above. Cowls, ruching, asymmetry, and any elements that are hard to visualize in a flat fashion are where dress forms are truly indispensable. What I love about draping is that it is easier for me to visualize than flat pattern making, as creating a shape in 3D feels like a more organic process than drafting in 2D. 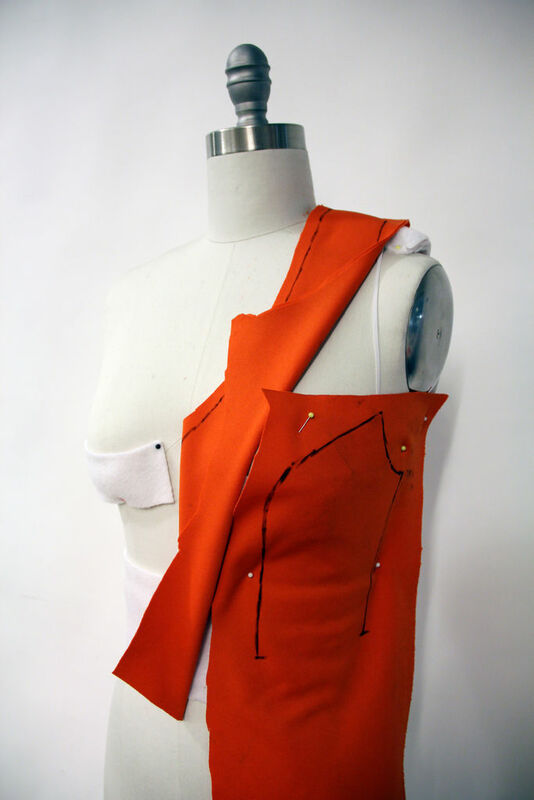 In this tutorial I am draping a simple form fitting pattern. While buying a flat pattern would probably be the quicker way to go in this case since it is an common shape, I wanted to keep it simple in order to demonstrate the basic process of draping, fitting, and drafting the pattern. All patterns, from a basic pattern like this to a complicated draped design, will follow very similar principles. I'm not going to go into too much detail on the different types of dress forms out there, but I will say that I've been using a cheap one (Studio One) for years and it has served me as well as the expensive Wolf forms I used in fashion school (the industry standard). By far the most important thing is getting a form that closely fits your proportions, beyond a simple bust-waist-hip measurement. There are a lot of different variations in fit and proportion out there, so thoroughly measure your body and do your research. Any form can be padded out, so you always want to get a form where every measurement is either equal to or smaller than yours. In particular take note of the position of your bust apex, and back neck to waist measurement. It is easy to pad out a waist. But you aren't going to be able to move the bust up and down, or shorten the torso. Once you find a form with similar positioning of these major parts of your body, you can look at the circumference of the bust/underbust/waist/hips, and choose a form from there. Some other features to keep in mind are collapsable shoulders (really handy for tight garments), pinnability (some really cheap forms don't have a nice surface to pin into), and a foot pedal for raising the form up and down. Alvanon: also expensive, based on thorough research of body shapes for a more realistic fit. Fabulous Fit: designed to be customized, not that expensive. I've heard mixed reviews, but cool concept. And if you want to go totally DIY, you can make your own! Just be warned that with this technique the pinning surface isn't that great. Still, for $20, it's pretty sweet. In my case I was using a form that was not my own, and have therefore only done a very basic padding job. This dress form had a shorter torso than me, and the bust line was too high. To adjust for the height of the bust line, I padded it out below, and to compensate for the shorter height from bust to shoulder of the form, I padded the shoulder to match my apex to shoulder distance (note that this padding would mess with sleeves if I had any, this would be a terrible form for me to have permanently). Lastly I padded the waist, as it was an inch too small. The next step is to mark the lines of your pattern. I am draping a simple V-neck with princess seams that end in the side seam, so I pinned down cord to mark out those seam lines. Note that you only need to mark one side of the form if your pattern is symmetrical. With that, you're ready to drape! The principle behind draping is to pin fabric to the form, and mark the intended pattern piece along the pattern lines you have created. In this case there are no complicated draped elements, so this is quite straightforward. However even for complicated garments the same principle always applies, of marking the fabric in a way that you can replicate what you just created as a flat pattern once you've taken it off the form. For each piece, dot along your pattern lines (I drew solid lines here for higher visibility of what I'm doing), and mark major points such as the intersection with the waist line with a notch. Notches are tick marks that will be clipped upon cutting the pattern, and serve as a way to match up two pattern pieces in the correct places. They are especially useful in situations where one piece is gathered and being sewn to a non-gathered piece, as the notches will indicate where the gathering on the one piece begins and ends, and how much to gather, all by lining up the notches. As both the front and back are going to be seamless, I draped with the fabric on the fold so I could use it for the muslin (draft garment) in the next step. After marking each piece, fold it back and work your way around the form. Take your marked pieces off the form. Trim them all to your desired seam allowance for ease of sewing together into a first draft of your garment. In this case the front and back were draped on the fold, leaving just the other two side pieces that needed a second one cut for a full bodice. Baste everything together, and try it on to see how close you got! Don't dismay if things don't fit perfectly. Patternmaking is an iterative process, and no matter how much you measure, a dress form does not move like a real person. I unfortunately don't have a photo of my first fitting, but you can see from comparing the second and third photos what changes I made. Take a look at the image notes for more details. • First step is to make sure the garment is sitting in the right place before you start making alterations. By this I mean align the curves where they are supposed to go, bust apex, your bum, hips, etc... It's much easier to extend or contract a strap than to adjust a bust curve. • Second, notice where things are too big, and pin them to size. If you see wrinkles and pulling, it's likely too tight. In those areas pull out the stitches, and mark how much you need to add to make it fit properly. These are pretty basic instructions, but they will get you a long way if you are new to fitting alterations! Try and try again until you get it right! Take your first draft of a pattern, and cut out a new set of pattern pieces based on your changes. For me I felt that my second round of alterations was sufficient, and continued to draft the pattern following this fitting. See image notes for more detail on the alterations I made this round. Once you are happy with the fit, it's time to draft a paper pattern to officially add it to your pattern collection! The process for this is pretty simple. Take apart your muslin, and lay each pattern piece down on pattern paper with a layer of tracing paper face down in between. Trace around the outside of your pattern piece with a tracing wheel, taking any final alterations into account. The spokes on the tracing wheel will transfer a dotted line of your pattern piece from the transfer paper to the pattern paper below. Once you've transferred your pattern, draw around your pattern pieces to smooth out your lines. Using dress curves for this step is handy, although not pictured here. Cut out your pattern. I usually do not add a seam allowances on mine because that depends sometimes on what material I'm using, and I like to add it on a case by case basis. However some people add the seam allowance before cutting out the pattern. If need be you can iron the paper to make it lay flat (handy little trick for pattern paper that usually lives in a tight roll). And voila, we've used a dress form to drape a custom fitted pattern! Thanks so much taking time of making this it is very handy. I am still learn and I have bought a dress form that is very close to my size of my body but find out information of how to use one the information is very limited it unforgent . Thank you for this instructable. I am working on 2 similar projects but I'm a newbie and enjoyed reading your expertise on dress forms. Thanks, I'm so glad you've found it helpful. I was surprised when I searched for similar instruction online how little there is on the subject, glad to have this out there!